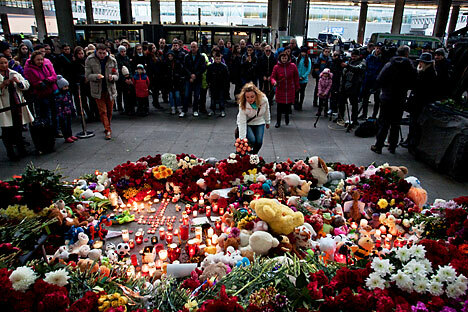 The Pulkovo airport memorial devoted to the 224 passengers who died on the flight from Sharm el-Sheikh, Egypt to St. Petersburg on Oct. 31. Efforts have been stepped up to find ways to curb the influence of terrorists from Islamic State along Russia’s southern borders. Shortly before the terrorist attacks in Paris, Islamic State militants released a video published in Russian. “Soon, very soon,” it said, “there will be a sea of blood.” Analysts believe ISIS is a very real threat for Russia. A Russian charter aircraft was blown up on October 31, killing all 224 passengers on board a flight from Egypt to St. Petersburg. On November 20, six Russians were killed in Mali during a terrorist attack on a hotel. Though ISIS has so far only hit Russians abroad, Russia has a turbulent history with its own Muslim-majority regions in the south, and is itself not immune to large-scale terrorist attacks. “We have sufficient experience in reacting to such challenges and threats,” said Vladimir Kolokoltsev, Russia’s Interior Minister. Russia’s weakest security points are the Northern Caucasus and the southern borders of the former Soviet republics, where analysts fear that Muslims rebuffed from mainstream society will look to extremists for answers. Of the country’s 16.5 million Russian Muslims, Islamic State may have up to half a million sympathizers, according to Alexey Malashenko, chair of the Carnegie Moscow Centre’s Religion, Society, and Security Programme, in an essay published on the centre’s website. These Russian Muslims might be averse to terrorism, but they are seeking a Muslim-centric form of government, Malashenko wrote. Around 2,400 Russians are estimated to be fighting for Islamic State in Iraq and Syria (ISIS), according to figures up to September 18, and almost 3,000 citizens from the Central Asian republics are also involved, Sergei Smirnov, First Deputy Director of the Federal Security Service (FSB) told Interfax. The Northern Caucasus has long been a region of unrest, with roots of insurgency dating back to the 18th century. The most recent conflicts flared after Chechnya declared independence from Russia in 1991, instigating the first Chechen War (1994-96). A short cease-fire lasted until 1999, when the Second Chechen War began. By early 2000, Russia had almost completely destroyed the capital city of Grozny and regained direct control of the republic. In 2009, Russia officially ended its antiterrorist operation there, although low-level insurgency has continued, most notably in Chechnya, Ingushetia and Dagestan. Terrorist attacks throughout Russia have been attributed to radical Islamists from the North Caucasus: the Russian apartment bombings in 1999; the Moscow theatre hostage crisis in 2002; the Beslan school hostage crisis in 2004; the 2010 Moscow Metro bombings; and the Domodedovo International Airport bombing in 2011. The toll of dead from these attacks is 849.